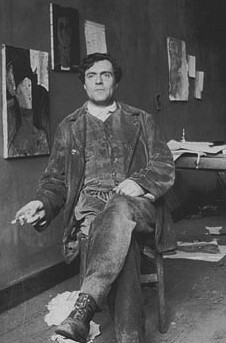 Amedeo Clemente Modigliani (July 12, 1884 – January 24, 1920) was an Italian artist of Jewish heritage, practising both painting and sculpture, who pursued his career for the most part in France. Modigliani was born in Livorno (historically referred to in English as Leghorn), in center-western region Tuscany in Italy and began his artistic studies in Italy before moving to Paris in 1906. Influenced by the artists in his circle of friends and associates, by a range of genres and art movements, and by primitive art, Modigliani's œuvre was nonetheless unique and idiosyncratic. He died in Paris of tubercular meningitis, exacerbated by poverty, overworking, and an excessive use of alcohol and narcotics, at the age of 35. Amedeo Modigliani was born at Livorno, in Tuscany. Livorno was still a relatively new city, by Italian standards, in the late 19th century. The Livorno that Modigliani knew was a bustling centre of commerce focused upon seafaring and shipwrighting, but its cultural history lay in being a refuge for those persecuted for their religion. His maternal great-great-grandfather was one Solomon Garsin, a Jew who had immigrated to Livorno in the eighteenth century as a religious refugee. Modigliani had a particularly close relationship with his mother, who taught her son at home until he was ten. Beset with health problems after an attack of pleurisy when he was about eleven, a few years later he developed a case of typhoid fever. When he was roughly sixteen he was taken ill with pleurisy again, and it was then that he contracted the tuberculosis which was to eventually claim his life. Each time it was his mother Eugenia's intensive care of him which pulled him through. After Modigliani had recovered from the second bout of pleurisy, his mother took him on a tour of southern Italy: Naples, Capri, Rome and Amalfi, then back north to Florence and Venice. The work of Lautréamont was equally influential at this time. This doomed poet's Les Chants de Maldoror became the seminal work for the Parisian Surrealists of Modigliani's generation, and the book became Modigliani's favorite to the extent that he learnt it by heart. The poetry of Lautréamont is characterized by the juxtaposition of fantastical elements, and by sadistic imagery; the fact that Modigliani was so taken by this text in his early teens gives a good indication of his developing tastes. Baudelaire and D'Annunzio similarly appealed to the young artist, with their interest in corrupted beauty, and the expression of that insight through Symbolist imagery. Head (1911) Note the influence of Cambodian art in this sculpture. In Modigliani's art, there is evidence of the influence of art from Africa and Cambodia which he may have seen in the Musée de l'Homme, but his stylizations are just as likely to have been the result of his being surrounded by Mediæval sculpture during his studies in Northern Italy (there is no recorded information from Modigliani himself, as there is with Picasso and others, to confirm the contention that he was influenced by either ethnic or any other kind of sculpture). A possible interest in African tribal masks seems to be evident in his portraits. In both his painting and sculpture, the sitters' faces resemble ancient Egyptian painting in their flat and mask-like appearance, with distinctive almond eyes, pursed mouths, twisted noses, and elongated necks. However these same characteristics are shared by Mediæval European sculpture and painting. The following summer, the Russian sculptor Chana Orloff introduced him to a beautiful 19-year-old art student named Jeanne Hébuterne who had posed for Tsuguharu Foujita. From a conservative bourgeois background, Hébuterne was renounced by her devout Roman Catholic family for her liaison with the painter, whom they saw as little more than a debauched derelict, and, worse yet, a Jew. Despite her family's objections, soon they were living together, and although Hébuterne was the current love of his life, their public scenes became more renowned than Modigliani's individual drunken exhibitions. During a trip to Nice, conceived and organized by Leopold Zborovski, Modigliani, Foujita and other artists tried to sell their works to rich tourists. Modigliani managed to sell a few pictures but only for a few francs each. Despite this, during this time he produced most of the paintings that later became his most popular and valued works. In May 1919 he returned to Paris, where, with Hébuterne and their daughter, he rented an apartment in the rue de la Grande Chaumière. While there, both Jeanne Hébuterne and Amedeo Modigliani painted portraits of each other, and of themselves. * Head of a Woman (1910/1911).